Also take note of the journal in which it’s published. Reputable (biomedical) journals will be indexed by Pubmed. [EDIT: Several people have reminded me that non-biomedical journals won’t be on Pubmed, and they’re absolutely correct! (thanks for catching that, I apologize for being sloppy here). Check out Web of Science for a more complete index of science journals. And please feel free to share other resources in the comments!] Beware of questionable journals. Do you have anything to add to this guide? A completely different approach that you think is better? Additional questions? Links to other resources? Please share in the comments! One other great resource to get research articles besides pubmed is arXiv.org. They have particularly articles in the natural sciences, all open free of charge (the author uploads their own generated copy even for articles which eventually appear in embargoed journals). You can see if the article is accepted, published, or simply submitted in the meta description which is useful to tell if it has been peer-reviewed and which journal it is submitted to. Another resource of course is Sci-hub to get nearly any primary research article you want instantly. Fantastic for particularly for citizens or scientists not at large research Universities with wide journal access, but perhaps less legal at this time. I sent you an email looking for the PDF version of this information to relay to my students. If your email address at Utexas is no longer active, please provide another one that I can reach you. Thanks in advance. Your article is quite helpful. Please send me the pdf file. My email: keduprof@163.com Thank you! I would also like the PDF file for my students. Aloha! Great article. Could I also have permission/pdf to share with my nursing students? Thank you! I would also really appreciate a PDF of this article to share with my students!! samorris@uab.edu. Thank you!! You can all make a pdf copy of this by clicking “ctrl + p” which takes you the print page; or right click and select print. Then in the box asking you where to send it, click the arrow and select save as pdf. Pingback: Very useful (for scientists too): How to read and understand a scientific paper: a guide for non-scientists – microBEnet: the microbiology of the Built Environment network. Thank you very much for posting this. I have been looking for something like this for ages. Great blog too! Keep up the good work. Hello thanks for writing this, as a biology undergrad student I hope that it helps me better understand how to read science papers! Because at the moment I find it difficult. My question is: How do I go about doing number 11? Like where can I find critiques of papers? Especially recent ones! There isn’t really a clearinghouse of critiques of papers. Instead, you find this either in review articles or in other primary articles that cite the article you’re reading. Often the commentary is subtle, so it takes practice to learn to read between the lines. Thought you’d like to know that I assign this to my Intro to Research class and also to our IMSD undergrads and grad students. Thanks you a lot! It helps me to read my papers in computer science. But I am a little bit confused how to distinguish SPECIFIC QUESTION from BIG QUESTION. Sometimes they look the same to me. With your permission, I would love a pdf version of this article to share with my undergraduate researchers in the McNair Scholars Program at the University of Central Missouri. I saw your name, and then started to yearn for yummy yummy Cafe Noir cookies. Our family really enjoyed our visit to http://zaansmuseum.nl/?lang=en which included a functioning Verkade cookie manufacturing display (my husband’s father was from near Amsterdam, and this is one place hubby liked to go to as a child). It is a museum of windmills and Dutch history, especially industrial history. Though, on further review is not quite off topic. I followed your links and discovered you are very active in science communication. Most excellent work, and I hope the children of my husband’s cousin get to learn and participate in what you have worked on (they should be in secondary school now). Thanks Chris! There is a good probability that your husband’s cousin’s kids have seen at least some of our projects in school. And yes, Verkade is a last name famously associated with cookies and chocolate in the Netherlands. Unfortunately, no giant chocolate family inheritances for me. I’m not related to the cookie branch :). Can you please send me a pdf of the article or even the shorter article I saw on Facebook? I teach biomedical science. This is a great piece. I would really appreciate a copy of the PDF to distribute to a first year course I am teaching at Australian Catholic University. I think this will really help to give students some tools to deal with and better understand the scientific literature. Hi Jennifer: A colleague sent me this link to the guide for reading a scientific paper. I remember reading through it when it first came out and really appreciate what you’ve done. However, a couple of heads-up. 1) Your link to “questionable journals” takes us to Jeffrey Beall’s lists of predatory journals and publishers. Jeffrey is a friend of mine and I’ve had him speak to my Science Research Seminar class the last two years. CU Denver made Jeffrey take down the site because it was becoming a legal nightmare for the University; they felt they could no longer support him. When the FTC started coming after OMICS, OMICS in turn came after Jeffrey. It’s really unfortunate that we no longer have access to this great resource. Hypotheses are not predictions. It’s a common misunderstanding and is taught incorrectly throughout a student’s science education. I published on this in the American Biology Teacher’s September 2015 issue. 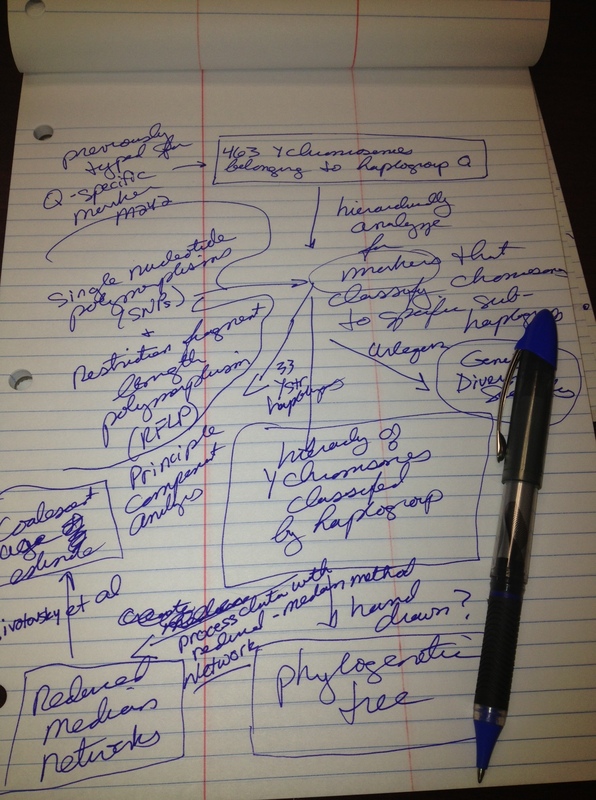 I’ve also blogged about it (https://mrdrscienceteacher.wordpress.com/2014/11/02/teaching-the-hypothesis/). This is a prediction based on the hypothesis that driver safety courses produce more cautious drivers. The author confuses experimental hypotheses with statistical null hypotheses. Indeed, the concept of the null comes from statistics, not the other way around. Hey, there are fruit flies on my bananas. Is it that fruit flies just like bananas, or that they are attracted to them because they are ripe? I bet that the fruit flies are attracted to the bananas because they are ripe. Hypothesis: Fruit flies are attracted to bananas when they are ripe. Now at this point, yes, you could come up with a direct opposite statement and call it the null hypothesis, but I think that’s a waste of time. I also NEVER see this done in scientific publications, but maybe I haven’t looked closely enough. If a tested hypothesis is provided (and not written as a prediction, it is always written as a description of a possible pattern (generalizing hypothesis) or as an explanation (explanatory hypothesis). There is never an null statement paired with it that I have ever seen. My argument is that the null statistical hypothesis is a mathematical expression borne from inferential statistics (e.g. O = E, u1 = u2, r = 0). The null statistical hypothesis states a current condition (not a prediction). For Chi-square: The observed distribution and expected distributions ARE equal and any differences we see between them are just chance differences. For the t-Test: The two populations from which the samples were taken HAVE equal means and the difference we observe between the sample means is merely a result of sampling error. For Regression: There IS no relationship between the X and Y variables and the appearance of a relationship is accidental. I disagree that a null hypothesis can be a prediction of what should happen as the result of an experiment if the experimental hypothesis is false. That just mucks it all up and adds to the confusion that at least some kinds of hypotheses can be written as predictions. We never accept the statistical null hypothesis unless it is actually true and, for example, the observed distribution does in fact equal the expected distribution. If this is the case, then there is no need for doing a Chi-square Test. If two sample means turn out equal, then there is no reason to do a t-Test. However, if the error bars are huge, I’d be skeptical of concluding that the sample means are at all representative of the populations from which they were taken. I feel that we all need this! Not only would it vastly improve vaccination rates, it will also shed some much needed light to the alarming fall in prevailing climate change denier/skepticism! This is excellent – I plan on posting it for my philosophy students to read. One comment and question: you mention that scientific vocabulary is unfamiliar to non-scientists, and therefore it is important to look up every unfamiliar word. I agree – in my teaching I very much emphasize the understanding of basic definitions of concepts. However, as in science, much of philosophy vocabulary is specialized, meaning that you will not find the correct definition in regular dictionaries and encyclopedias. For philosophy, I recommend to my students the Stanford Online Encyclopedia of Philosophy (https://plato.stanford.edu), the Internet Encyclopedia of Philosophy (http://www.iep.utm.edu/eds/), and the hard-bound Encyclopedia of Philosophy available in most good research libraries. What science-specific dictionaries and encyclopedias would you recommend? Excellent. I’ve added a link to this post in the online errata and additions section of my book (“Writing for Science Journals”; http://www.geoff-hart.com/books/journals/journal-book.htm). In addition to being an excellent primer for nonscientists, it’s a great article for teaching young scientists how to read — and write! — journal manuscripts. When I finally get around to writing the 2nd edition, I plan to integrate several of your points into the revised text. I’d say that the title isn’t quite correct, it’s not just for non-scientists, it’s for non-academics. There are many people who would regard themselves as scientists but don’t read papers. You can right click on any blog post or most article, select “Print” … and under “Destination” click the “Change” button. In the menu, you should have an option to “Save as PDF.” It won’t be the neatly formatted pdf that Jennifer already supplied, but this can be handy for future use. It can also save a blog post plus comments for those good discussions you might want to look at later. Great. I’m sharing with our members via our latest magazine issue and will be crediting you as the author. Thanks for sharing. A nice guide for scientific publications reading !